AdobeEarth Houses on 1.5 Rai, 59 Sqwa with deeds. The property includes 7 Adobebungalows and three dormitories (in total 21 beds and 8 bathrooms); 1 mainbuilding with three rooms and 2 bathrooms; 1 large kitchen with Pantry andstore room/ staff sleeping quarters. Tree house, 2 sala and parking for 6 cars.WiFi is throughout. 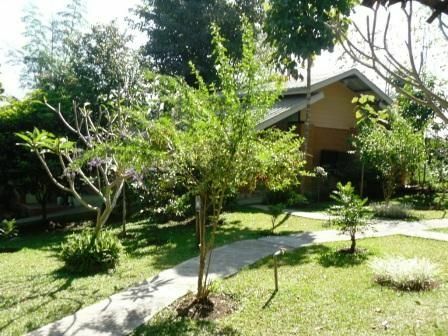 Set in beautiful gardens with mountain views, just 3.5kilometers from Pai center and 2 Km from Pai Airport. Ready for service. Price is 8’000'000 baht. Rental price is 12,000 baht per month + deposit 50,000baht.